I have a little good new, a little bad news, and some down right ugliness. 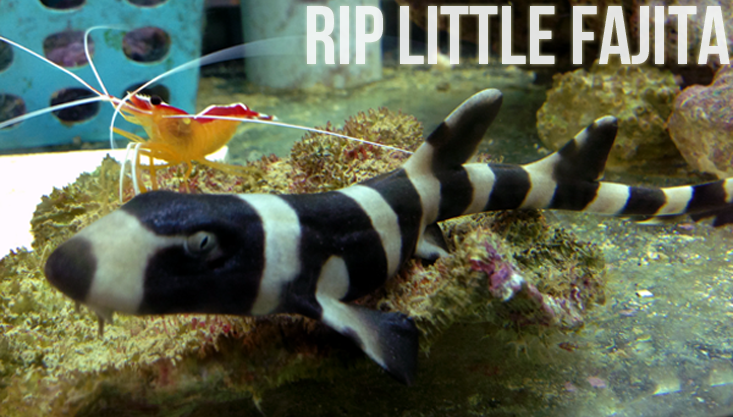 The good news….we have a new baby shark. Meet little Taquito. He was born last week and is already eating and doing just swimingly. The bad news….he doesn’t have a big brother. Which leads to the ugly….my ugly cry. Apparently, while I was in Atlanta for Haven, Fajita had an accident. Tim said he walked downstairs and found him lying on the bottom, with a gash on his head. This makes me so sad, because I know Tim tried everything to bring him back. For goodness sake, that shark has been eating out of his hand for almost a year. I can’t even imagine the sadness he felt and I wish I would have been there for him. He didn’t want to upset me while I was on vacation, so he kept it all inside. Then he didn’t want to tell me while we were looking at wedding venues because he knew how sad it would make me. So about a week after it all went down, I got the news. Ugly cry ensued. It may seem silly to you, but we hatched him from an egg. Watched him grow, and dreamed of building him a shark paradise. Instead he found a home in our backyard, with the prettiest flowers we have. Which are now growing beautifully. Rest in peace little Fajita…we miss you bud. I think I just cried a little. Fajita and I shared a special bond as in he was the first shark I got to meet that I wasn’t afraid of. His colors may have inspired me to get the beau to batt my eyes and start a tank of our own someday. May the little guy rest in piece. Such a tragedy, he was so young. I’m so sorry. It is hard to lose our saltwater creatures. One of my tanks crashed horribly and it was heart breaking to see my baby clown fishes (who were no longer babies, but close to three years old at that point) and the only Manderin I had ever seen that would take frozen food, and all their other tank mates lifeless in the water so I totally understand it and I really do feel for you. On a happier note a couple of questions. How big is that tank? And – I’m surprised the shark doesn’t bother the cleaner shrimp in the picture with him. Do they always get along? Oh man, that would be terrible! And wait a second…you had a Manderin eating frozen food? I can’t keep those guys alive to save my life. I have tried three of them and just can’t get the hang of it. That’s impressive! Ughhhh I can’t even imagine the whole tank getting wiped out. oh noooooooooo! So sorry friend! RIP Fajita! I love Taquito’s name though and that he’s living on and hopefully prospering with you guys. Once again, mad props to Tim for being so thoughtful. I know at first I was upset that he waited to tell me, then I felt guilty for not checking on him for over a WEEK, then I came to terms that I am really glad Tim knew it would make me sad and waited to tell me until I had things to make me REALLY happy. I still can’t believe how long he kept it a secret though!! !